Ten years after the bloody Spanish conquest of Mexico, the Mother of God appeared to an Aztec craftsman named Juan Diego. She appeared as an Aztec herself and addressed him in Nahuatl, the Aztec tongue, in a manner one would address a prince. She appeared several miles outside Mexico City, which had become the center of Spanish power. She insisted that a shrine in her honor be built on that spot among the conquered people. She sent Juan Diego back to the Spanish clergy to "evangelize" them -- the ones who felt they already had all the truth. In each of these ways she restored dignity and hope to native people who had been dehumanized by foreign oppression. A shrine was later built where Mary appeared, and Juan Diego spent the remaining 17 years of his life there, repeating her message of hope and liberation to all who would come. About eight million Native Americans became Christians in response to this message. In every age the miracle of Guadalupe should remind the Church that those the Church alienates are precisely the ones who have the gifts she needs so badly to grow and be reformed. No one is completely enlightened. We must each proclaim the Gospel -- and hear it proclaimed from one another. His feast day is December 9. He devoted himself to hard work in the fields and manufacturing mats. He owned a piece of land and a small house on it. He was happily married but had no children. During one of this walks to Tenochtitlan, which used to take about three and a half hours between villages and mountains, the First apparition occurred (See The apparitions page), in a place that is now known as the "Capilla del Cerrito", where the Blessed Virgin Mary talked to him in his language, Nahuatl. She called him "Juanito, Juan Dieguito" , "the most humble of my sons", "my son the least", "my little dear". After the miracle of Guadalupe and with the Bishop's permission, Juan Diego moved to a room attached to the chapel that housed the sacred image, after having given his business and property to his uncle, spending the rest of his life as a hermit. There he cared for the church and the first pilgrims who came to pray to the Mother of Jesus, and propagating the account of the apparitions to his countrymen. 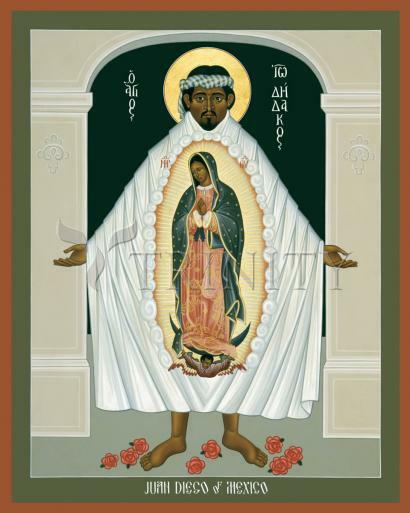 Pope John Paul II praised Juan Diego for his simple faith nourished by catechesis and pictured him (who said to the Blessed Virgin Mary: "I am a nobody, I am a small rope, a tiny ladder, the tail end, a leaf") as a model of humility for all of us.